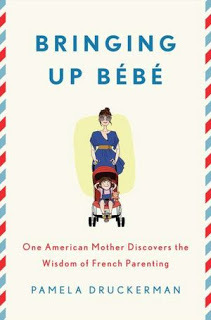 Bringing Up Bebe by Pamela Druckerman is a French parenting book about the differences in parenting in France versus the United States as observed by an American mother living abroad. I am apparently on a non-fiction kick right now. I recently read this article about French parenting titled “Why French Parents are Superior” (suspiciously similar to the article “Why Chinese Mothers are Superior” which preceded Battle Hymn of the Tiger Mother) and when I saw at the end that it was an excerpt from a new book, it was only a few clicks to see if the library already had it. Happily, Bringing Up Bebe was already on order and it arrived a few days later. And I blazed through it in a couple of days, and then proceeded to talk the ears off every person I saw for the next few weeks. Really, you don’t want to know me in real life when I’m reading a book I love. At the very least, you should hope to live far away and be inaccessible by phone or email. Pamela Druckerman is an American who moves to Paris with her British husband. All three of their children are born in Paris and attend French day cares and preschools (at the time of the writing of the book, their oldest daughter appears to be in about first grade). As she still visits the States periodically and has many American friends who are also navigating parenthood, it becomes quickly apparent to Pamela Druckerman that French parenting does NOT look like American parenting. I’ve been particularly taken by the differences in eating in France, and how children really eat most items. Part of it is that they aren’t snacking from the moment they awake until the moment they go to bed, but also French parents see it as part of their responsibility to introduce their children to a wide variety of tastes and to learn to appreciate them. The idea of letting your child eat nothing but white pasta and french fries is absurd in France. The emphasis on having your own life outside of parenthood is also fascinating to me. French parents don’t seem to have the same guilt that so many American parents do and they have no qualms about putting their children to bed, firmly explaining that the evening is for adults, and then expecting their child to remain in bed. They go on vacations without their children and when they have play groups, the children play together and the parents talk calmly and separately, not breaking up arguments or sitting on the floor with Legos. And the fierce competition and need for “advanced” children that exists in American parenting really isn’t part of the equation in France. They’re not in a rush for their children to skip to the next level or have the teachers gloat over how brilliant a child is. Really, I could go on and on about the many interesting differences that she points out. There are some things that she doesn’t agree with entirely, but overall, she does feel like not only are French parents less stressed and more able to enjoy parenthood, but that the children are happier too (in addition to being much better behaved and able to identify the differences between goat, blue, and Gruyere cheeses by age three). I’ve incorporated several things into my own parenting, including cutting out all snacks except for one in the middle of the afternoon (and, like a miracle, my child suddenly eats everything at meal times, sitting quietly and calmly while we eat our own food. Also, I am actually hungry for meals, instead of telling Bart when he comes home for lunch that I just ate breakfast thirty minutes earlier). I also have really encouraged Ella to play more on her own (which I thought would be wildly unsuccessful and has actually. . . .not been wildly unsuccessful). And I’m making more time for the things I want in my own life, like running and reading and cooking. There are parts of this French parenting book that drag, but a “dragging” part was usually one or two pages at the most and then it’d be 50 pages of completely fascinating stuff again. And of course, I’m not buying into EVERY thing she talks about French parents doing in Bringing Up Bebe. I’m not planning to stop nursing my next child at three months and I don’t think I’ll be sending Ella on an 8 day school trip in first grade. Also, although she doesn’t talk specifically about this, I noticed that her descriptions of French parenting don’t seem to lend themselves nearly as well to things like individuality or that the French society cares nearly so much about creativity as we care in America. But even those disagreements are disagreements with the culture (or at least her portrayal of it), not the book itself. So. . . what country is going to be the focus of the next “Why __________ Mothers/Parents are Superior”? I feel like I AIM for all that, but feel like I shouldn't because that's not how it's done. I admit, I don't play with my kids all day. I shoo them away and expect that they can entertain themselves. And I would KILL to go away overnight without them. In fact, we have such an opportunity, PAID FOR, and I will not be able to go because I don't have anyone to ask to keep them. It is KILLING ME. This looks very interesting. I will definitely be checking this one out. I can't wait to read this book! Like Lisa, I feel like I already parent differently than a lot of people I know–I am a LOT more laid back in many areas, and I think my children are benefiting from it (my personal opinion, of course, others may disagree–ha!). On the other hand, there's a lot I would like to learn more about. The snacking is definitely a problem in our house, and I would love to work on cutting it out. I loved this article, missed the part where it's a book too! I think there are so many great points and ideas that this brings up in how we raise our kids and what kind of adults those kids will become. Fascinating. As an American kid growing up with Dutch parents, I already knew the American parenting style differs from that of most of Western Europe..my mom was legendary on our block for not letting her kids or her kids' playmates snack whenever we wanted (we had to *shock horror* ask before grabbing something to eat or drink -except for water, we could have all the water we wanted- and the answer was usually no, unless it was four o'clock and thus teatime and thus time for a snack). After we moved to the Netherlands, I don't think I brought home another parental consent waiver again. Which was probably a good thing as I was notoriously bad of getting them out of my backpack into my mom's hands. I'll stop hijacking your comment section now..I'm glad you liked the book and I'll be sure to read it before I become a mom! I'm so glad you read this and liked it! I put a hold on a copy at the library weeks ago when it was on order and I am so anxious to get it. I love being an American, but I recognize that much can be learned from the rest of the world. Do you feel like if you put some of these things into practice it can never be successful in the same way it is there because that's not what everyone else is doing with their children in America? That's what I'm afraid of. But at least I can have control over the food thing. I'm like #40 on the waiting list at my library. Bah. This looks like it's going to be next on my to-read list. I must throw in my amen to no snacking (just one), and letting kids amuse themselves. I read your post this morning while three of my kids were entertaining themselves (reading, or pretending to) and two were finishing breakfast. I would go insane if they didn't know how to play on their own. Also, I just put it on hold at my library, and I'm hold number 264 on a total of 8 copies. I guess it'll be awhile. This is in my digital library queue and I am quite impatient! Mostly I just want more reasons to move to France and more validation for the "French" ways I already parent. Vive le chocolat! This sounds so interesting. I actually hardly ever give my kid snacks. He eats big meals usually, and that seems to work fine. He also plays by himself pretty much all day, but I think part of that is just his personality. I did not know that parents in America attend birthday parties with their kids. Mine never attended with me. And when I had parties I don't think other parents were usually there. This is something I will have to observe more carefully. Funny that you posted about this, a friend was just telling me about this book the other day, and I requested it at the library…I guess everyone is talking about it, as I am number 24 on the queue! Hmmm! Sounds like I am a bit of a French parent, except I still have some of the guilt? I kinda laugh at parents who let their kids stay up late- I need my own space, too! I will totally check this one out… In ten years when it will be available at the library. which I really loved because I think that it outlined well the differences in the two parenting styles (French and American) and the resulting outcomes. Different characteristics are held in esteem between the two and so it makes sense that the parenting styles would be different too. I will probably still read the book though. I love this concept, and it seems almost second nature. I once asked my mom about her parenting style (as I was preparing to become a mom), and she said, simply, "I just expected my children to obey." After watching her siblings try to discipline their children, then immediately turn to her and say, "Of course they'll do [that certain thing] anyway," she was shocked. I have very, very strong feelings for educating with respect for my children. I already have great respect for my one year old, and I expect that same respect in return. I guess I should've been french because I don't understand how this isn't just "normal" parenting. I actually think that in past generations Americans have raised their kids like this but for the past 20 years or so people have started the new (way over bearing in my opinion)way of parenting. Ever since having my own kids I've felt like the odd one out as far as parenting goes, not hovering and making them eat the same food that I make for Nick and I (I refuse to make two separate meals) and everyone is always shocked at how well they eat and how independent they are. Hm . . . I would like to read the book to see other "differences." Your list looks a lot like my family. I read Babywise as a new mother (American authors) and it saved my life. The best parenting advice my mother gave me is that "somebody is going to be in charge at your house, and it may as well be you: you are the grownup." Amen, mama. Fascinating comments! I agree with those who have said: this sounds like how we were raised. Much of French parenting is just common sense – and you can find plenty of that here in North America. (I am married to a French man and we have spent time living in France and North America with our two young daughters, so I have seen both styles of parenting up close!). There are differences, but French parenting isn't superior–just different. We're better at some things (creativity, empathy, initiative) and they're better at others (politeness, obedience, manners). I can't wait to read this one – I lived in Paris, France with my family when I was a teenager and I can definitely see a big difference in parenting styles. And it was always surprising to me how quickly I could pick out the American tourists around the city – they were the ones with the poorly behaved, loud, demanding children. I don't have any kids yet but I figure I'll read this one now and store the information for when it's more pertinent to me.